And now for the recipe that keeps overflowing my slow cooker, but is so incredibly tasty that I continue to make it. It is so tasty that I am willing to spend $180 (in gift cards – but it’s still money!) to buy a slow cooker that will enable me to eat this more often. I found this recipe on a Melbourne food blog, The Hungry Lawyer. The initial prep is a bit more complicated than I normally use for slow cookers – there’s a lot of chopping and measuring, and I always forget how much extra work it is, and allocate myself 10 minutes when I actually need closer to 20 or 30. To cut down on prep get the butcher to trim the cheeks for you. The first time I made these I did it myself – first of all, it was gross because cheeks are pretty ugly, and second of all, it took forever. Yes, I do need to sharpen my knives. But it’s still easier to get the butcher to do it. Even after trimming, it’s not a super lean cut of meat. If you’ve ever had those Asian stews where the meat melts in your mouth because they’ve used a nice fatty cut of meat, that’s what these cheeks feel like. Some people don’t like that mouthfeel, but stewy meat reminds me of mumfood, which I always find comforting. The beef in the picture is a particularly fatty piece – most of the cheeks were leaner than that. Also the sauce this makes it incredible. Like James will lift the plate to his lips and slurp it down. Place the sliced onions, lemongrass, chilli, galangal, ginger, garlic, coriander stems and crushed kaffir lime leaves in the bottom of a slow cooker. Slice each beef cheek into two even sized pieces. Coat each piece of meat in the seasoned flour. Heat the oil in a heavy based pan over medium-high heat. In batches, brown the beef for 2 or 3 minutes on each side until crispy and golden brown. 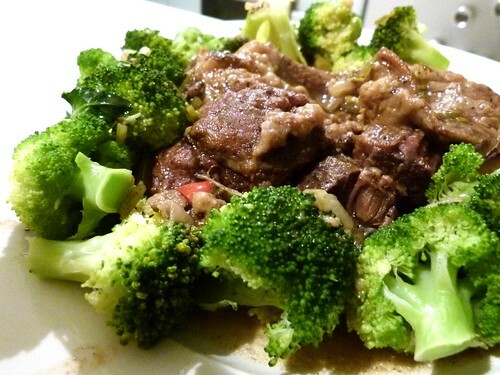 Make sure that your beef is well browned to ensure that it does not look grey and unappetising after slow cooking. Arrange the browned beef cheeks on top of the sliced vegetables. Add tamarind paste, brown sugar, fish sauce and water to the slow cooker. Cook on the slow cooker’s ‘Low Setting’ for 8 hours. I personally like to start the cooking on ‘High’ for an hour or two, then reduce the heat to ‘Low’. (Note: If you don’t have a slow cooker, you could cook this dish in a casserole dish in the oven on 170 degrees for 3 hours and 30 minutes). Great to discover that someone else loves this dish as much as me! I get my beef cheeks from the butcher in the bottom-right hand corner of the Queen Vic Market Meat Hall (viewed from when you are coming in through the Elizabeth Street entrance) – just oppoiste the free range chicken place. He actually labels his beef cheeks as ‘ox cheeks’ and they are absolutely massive! Might assist in stretching the servings out to 6 meals. That’s where I get mine too! They ARE pretty big, though they lose a lot int he trimming. I suspect James and I are just big eaters. OMG… I have just made this dish and words cannot describe the taste sensation in my mouth!!! Yum yum yummy!!!!! Heya! Once you’ve browned the beef everything goes in at the same time. Hope you like it! I’m not sure, sorry. =( I don’t think I’ve ever actually cooked lamb in the slow cooker so I have no basis for comparison. I’ve moved somewhere where I can’t easily get beef cheeks anymore so I sub beef chuck and it’s still delicious!